Give yourself over to passion with the masculine Colt Hog Tie; Bask in primal passion and submissive play with a set of 4 padded cuffs, swiveling universal clasps and heavy-duty 4 pointed harness. Give yourself over to sensational submission and leave yourself at the mercy of your dominant’s whims; The heavy-duty padded cuffs are made from a durable camo canvas with universal clasps and rings for endlessly creative restraint play. Four cuffs connect to a 4 pointed heavy-duty restraint harness to hold you tightly in place and let you lay back while your dominant takes over; Use the secure harness to try out a variety of new pleasurable positions. The cuffs are made with adjustable Velcro straps for versatile attachment to ankles or wrist; Connect the powerful cuffs to each other or to the 4-point harness and relinquish total control. 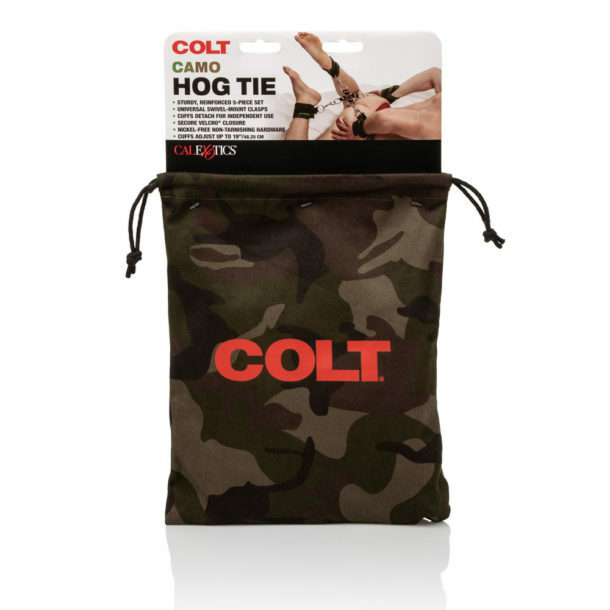 The four cuffs are thoughtfully crafted with a durable camo canvas exterior, a padded PU interior and Velcro enclosures; The 4-point hog tie harness hardware heavy-duty O rings are made from nickel-free, non-tarnishing zinc alloy.